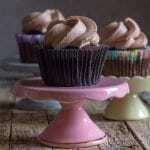 Who doesn't love Chocolate Cupcakes especially topped with a creamy Mascarpone and Nutella Frosting. Everyone will love these, perfect for a Party or Family get together. Pre-heat oven to 350F (180C), place 6 cupcake sleeves in a 6 tin muffin pan. Make the frosting first, in a large bowl add the mascarpone, Nutella, sugar and cream, beat until very thick. Refrigerate for one hour. (while cupcakes are baking and cooling). In a large bowl whisk together the sugar, flour, cocoa, baking powder, baking soda and salt, then add the egg, milk, vanilla and oil beat on medium speed for 2 minutes. Add the boiling water and stir with a wooden spoon or spatula (do not beat) to combine. Pour into prepared cupcake pan and bake for approximately 15 minutes (check with a toothpick for doneness). Let cool completely before frosting. Enjoy!